If you have a tooth that has had endodontic (root canal) treatment, it can last as long as your natural teeth. In some cases, however, the tooth can become re-infected. This can happen months or years after your original treatment. 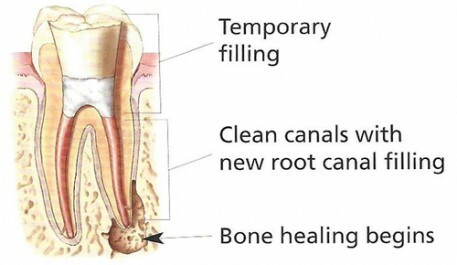 In some cases, the root canal can be redone with endodontic retreatment. Narrow or curved canals that were not easily accessed and were not treated at initial treatment. New decay (cavity) in the tooth. The permanent restoration (e.g., crown, filling) was not placed within the appropriate time following the procedure. 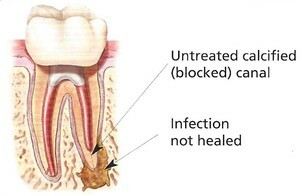 The permanent restoration did not create an adequate seal, allowing saliva and bacteria to re-infect the tooth. You and one of our endodontists review the appropriate treatment plan for you. If you both agree that retreatment is your best option for the success of your tooth, one of our endodontists gives you a local anesthetic to ensure you are comfortable during the procedure. The inside of the tooth is accessed and the filling material placed at your initial treatment is removed. If there is complex restorative material, such as a post or core, this is also removed. The canals are cleaned, disinfected and reshaped. At this point, a medicine called calcium hydroxide is placed in the tooth for up to two weeks. Why is retreatment done in two appointments? This procedure is completed in two appointments to increase the success of treatment. When you return for your second visit, we will re-clean, re-shape and remove the medicine inside your tooth. Gutta percha filling material is used to re-seal your canals and a temporary filling is placed on your tooth. Within six weeks after the completion of retreatment, you need to return to your family dentist to have the tooth properly restored with a permanent filling or crown.